Cortlandt Manor, NY, March 31, 2015, Joseph B. Cohen, RN, Clinical Application Services Manager at New York Presbyterian/Hudson Valley Hospital, has been recognized by Elite American Nurses for dedication, achievements and leadership in emergency and critical care. Mr. Cohen has been involved in health care for 39 years. Prior to joining New York Presbyterian/Hudson Valley Hospital, he served as a paramedic instructor for the New York State Department of Health. His vast experience and clinical knowledge enables him to achieve the business goals of the company. Mr. Cohen spends his days managing a team of eight clinical analysts, including nurses, and laboratory, pharmaceutical, radiology and cardiology specialists. He also implements a new computer system to automate all patient information and supervises training programs. Mr. Cohen feels privileged to be able to guide the hospital through its meaningful use of its journey. Mr. Cohen earned certifications in advanced cardiac life support and pediatric advanced life support, and a Bachelor of Science in health care administration from Iona College. He was honored for his work in the industry by Westchester Magazine for Excellence in Nursing in 2013. 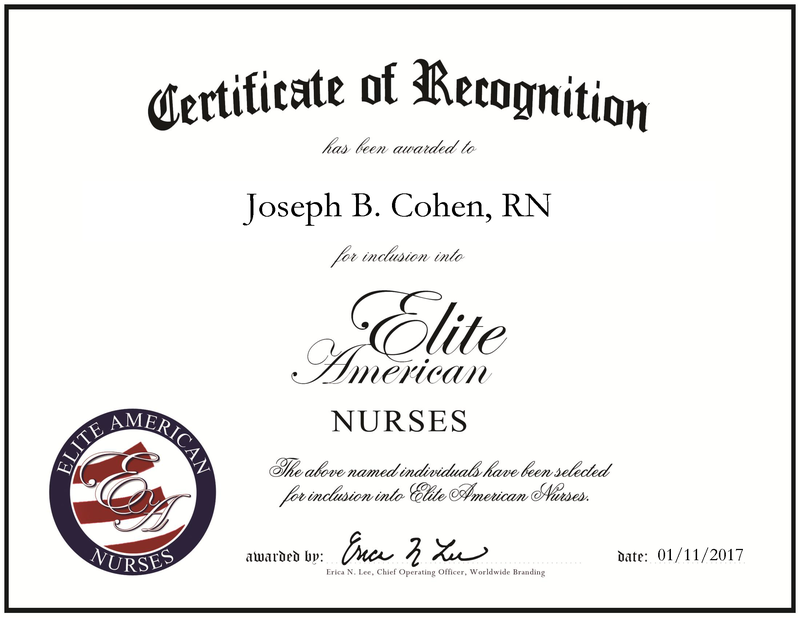 Joseph Cohen was originally selected for inclusion in EliteAMERICAN Nurses in 2015. We are proud to be featuring Mr. Cohen again in EliteAMERICAN Nurses for 2017. This entry was posted in Emergency Care and tagged clinical applications, critical care, hospital, life support, team management, training. Bookmark the permalink.